In a number of Canadian cities and towns, educators are receiving large numbers of Arab refugee and immigrant students in their classrooms. Immigration is a profoundly disruptive life transition requiring extensive adjustment and adaptation. These students may arrive with severely limited English language proficiency, and may have endured stressful socio-economic and emotional experiences. These experiences may contribute to negative attitudes towards school, poor behavior, lower academic performance and increased absences. Educators too may experience stress in their interactions with Arab students, due to the lack of a support system to understand the values, beliefs, backgrounds and socio-economic conditions of these students. Arabs consider themselves to be members of the Arab Nation, which they call “Al-Umma Al-Arabiyya.” When asked where they are from, Arabs may reply “I am a citizen of the Arab world” rather than identifying their country of origin. Although Arabs are united by language and history, each country’s culture is unique. Arabic is the universal language, but dialects vary between regions. It is estimated that there are about one million Arabs living in Canada, with about 20 per cent of that population in Alberta (2014). Canada has beenhome to Arab and Muslim people since the 1800s. Initially, Arab immigrants (both Muslim and Christian) came to Canada from the present-day countries of Lebanon and Syria. Christian Arabs tended to immigrate to central Canada (Ontario and Quebec), where some of them opened clothing factories. Muslim Arabs moved westward into the areas of Winnipeg and Brandon in Manitoba. Because they carried cases of supplies (such as needles, pins, beads and small clothing items) on their backs and travelled on foot to sell their products, they became known as foot peddlers. In reality, they were the original door-todoor salesmen! If successful in their business, many of these early pioneers went on to establish general stores. From Manitoba, Arab immigrants travelled across the areas of what would later become the provinces of Saskatchewan and Alberta. Those who settled in the Edmonton area got involved in the fur trade. They established a very good relationship with the Indigenous people, and intermarriages became common. From Edmonton, these fur traders travelled north to Lac La Biche, where several of them started mink ranches. Other Muslim fur traders continued further north into the Northwest Territories, where they opened trading posts. Whenever possible, the fur traders would return to Edmonton to meet with fellow Arabs who had established their homes and businesses in that centre. By 1938, Muslim Arabs were very concerned that their culture and religion were being lost. After many meetings, they decided to build Canada’s first mosque, the Al Rashid, which is now located in Edmonton at Fort Edmonton Park. It is important to recognize that these early Arab pioneers had no formal schooling. They were selfeducated and became successful through their desire to achieve. When they married and had children, they insisted that their children should receive the best education any school system could offer. Today, thanks to the groundwork established by early Arab pioneers, second, third and fourth generation Arabs are generally highly educated. Canadian Arabs are well represented in professions such as law, education, medicine and dentistry. Others are employed in the service industry. Arabs are commonly owners of businesses such as pizza shops, restaurants and bakeries specializing in pastries and pita bread. Many are also involved in hotel management. The single most important belief in Islam is that there is only one God—Allah. Followers believe that the Qur’an (which is considered to be the authentic collection of the word of Allah) was received by the prophet Muhammed through the archangel Gabriel. Although he is not considered to be divine, Muhammed is revered as the last and greatest messenger of God. Other prophets (which are shared with Jews and Christians) are also important in Islam. Like Christianity, Islam teaches that there is an afterlife and a transformed physical existence after death. Muslims consider their religion to be the one true religion and invite people of all races, nationalities and religions to be part of it. They also believe that people should have the right to embrace and practise any religion which they freely choose. Muslim observances, holidays and fasts are based on a lunar 12-month Hijra calendar. This calendar is slightly shorter than the solar, Gregorian calendar used in much of the world today. Because of this variation, each year Muslim holidays are observed about 10 days earlier than the previous year. Every Friday the weekly prayer is held in the mosque. This gathering provides opportunities for community building through social as well as spiritual interactions. Devout Muslims are expected to pray five times daily to remind them of God throughout the day. Each prayer includes a series of supplications, movements and recitations from the Qur’an. Once in their lifetime, every Muslim, if financially and physically able, is expected to perform a pilgrimage or spiritual journey to Mecca in Saudi Arabia. This is referred to as the Hajj. Muslim Arabs observe Ramadan, Muslim New Year and Ashura. They have two major celebrations, ’Eid al-Fitr (pronounced eed-ul-fit’-tar), which marks the end of the fast of Ramadan, and ’Eid al-Adha (which is the culmination of the Hajj, or holy pilgrimage to Mecca). The latter is commonly a three-day holiday that commemorates Abraham’s readiness to sacrifice his son for Allah. During these two celebrations, Muslim students do not attend school. During the month of fasting (Ramadan), Muslims who are physically able are required to fast from dawn to sunset each day. They abstain from all food and drink, marital relations, smoking and bad conduct during fasting hours. During this period, students need to be provided with a place to pray. Christian Arabs celebrate Christmas and Easter (although the date of celebration may vary slightly). Collectively, people from the communities listed below make up a significant (though still minor) portion of immigrants from Arab countries. In some cases these communities suffer persecution in their homelands, and they do not consider themselves Arab. The people of Iran, Afghanistan and Pakistan are not Arabs; however, their languages are written in Arabic script. Arabic is the religious language of Islam, and it plays a central role in the lives of Muslims. Many Muslims throughout the world have Arabic first names or surnames. These names often have positive or “sublime” meanings honouring an important historical person, relative or religious figure. Other names may imply a positive characteristic, such as patience. Although it is common, having an Arabic name is not required. Muslims may also have a non-Arabic name such as Jennifer (English), Shabnam (Persian) or Serpil (Turkish). Many Muslim women retain their maiden names after marriage, invoking a right established by Islamic law over 1,400 years ago. Consequently, teachers may encounter situations in which a student’s last name differs from that of the mother. This does not reflect on her marital status. For various transliterations, different spellings for the same name are common. It is important for teachers to ask students with non-Western names how their names are pronounced and to not take the liberty of labelling them with nicknames. Many Muslims are especially sensitive about their names. Arab Muslims are divided when it comes to music. Some consider it an important part of Arab culture. Others discourage listening to music or playing any instrument. Despite this division, music is played and songs are sung all over the Arab world by both Muslims and Christians. Some Muslims, however, consider music a forbidden entertainment. Parents may ask to have their children excused from music class. Arabic songs of celebrations, songs in praise of God and the prophets, or songs about nature are generally considered to be acceptable. An instrument called the oud was invented by Arabs and was later modified to what we now call a guitar. Food is a significant part of Arab culture. Being able to serve large amounts and a variety of foods (particularly to guests) is a source of pride. Traditionally, Arabs relied on a diet of dates, wheat, barley, rice and meat (usually lamb) with an emphasis on yogurt products. Arabic cuisine today has been influenced by other cultures such as India and Turkey. Because of the wide geographical distribution of countries, there are variations in both availability and preferences in food. Since Iraq is close to India and Iran, for example, their food has been influenced by that of their neighbours. Similarly, Egyptians enjoy dishes similar to those common in Lebanon, Syria or Jordan. shish kebab (meat and vegetables on skewers). Arabs who practise the Muslim faith are required to eat “halal” food. Halal is an Arabic word that means “permissible according to Islamic law.” The criteria specifies both what foods are allowed and how food must be prepared. For meat to be certified, it cannot be a forbidden cut (such as meat from hindquarters) or from an animal killed unmercifully. Pork, pork products and alcoholic beverages are defined as “haram” and are forbidden at all times. In very traditional and religious families male children are favoured, since a son is expected to care for the family and elders when they become unable to take care of themselves. A son is seen to bring honour to the family since he carries on the family name, which is a source of pride and strength. Daughters become part of the son-in-law’s family. In a traditional Arab family, there are defined gender roles. The man is expected to assume responsibility for financial matters, and the woman is to be in charge of the children and home. In more modern families, men and women are considered to be equals to a much greater extent. Generally, the father is still considered to be the head of the household and is expected to assume financial responsibility for the family. The home and children are considered to be the mother’s responsibilities. If the family is large, the mother may stay at home with the children. In families with fewer children, women are working outside the home in increasing numbers. Throughout the Arab world, traditional gender roles are being challenged. Many more women are being encouraged and supported in their efforts to obtain a good education and find success in a career. Increasingly, Arab women are becoming politically involved and are assuming leadership positions. Since ancient times, women throughout the vast Muslim world have worn a variety of coverings as a sign of modesty, and a symbol of religious faith. As with many traditions, practices are changing as the world is becoming smaller and better connected. Traditionally, the term hijab was used to describe the act of covering up. Today, it commonly refers to the least restrictive form of covering, a square or rectangular piece of fabric, which is folded and placed over the head as a scarf. The chador is a cloak worn as an outer garment, which is often left unfastened. It is predominantly worn by women in Iran. It covers the body from the top of the head to the ground and is usually worn without a face veil. This cloak is worn by women mainly in the Arab Gulf countries when they are in public. It may be worn to cover the head and body, or it may be worn over the shoulders as a cloak. It is usually fastened closed and may be combined with a head scarf or a face veil (niqab). Although it is often black, it may be decorated with coloured embroidery or sequins. The burka is commonly worn by women in Afghanistan. It conceals all of a woman’s body including the eyes, which are covered with a mesh screen. The niqab is a veil worn to cover the face. The eyes may or may not be covered. A thobe or jellabiya is a traditional tunic worn by Muslim men. It is usually white, but may be other colours as well. The top is usually tailored like a shirt, but the robe is loose and extends to the ankles. This square or rectangular head scarf (ghutra) may be worn by men along with a rope band (egal or agal) to fasten it in place. The head scarf is usually checkered red and white or black and white. In some countries it is called a shemagh or kuffiyeh. The family is the key social unit for Arabs. Families are expected to have dinner together. Parents are expected to spend time doing activities with their children. For Arabs, family honour is very important and is to be defended at all costs. The conduct of each family member impacts the way the family views itself as well as how it is perceived by community members. Social conduct, religious practice, dress, eating habits, education, occupation and marriage all reflect on family honour. Grandparents are to be honoured and respected. There is an expectation that they will be cared for by the family until their last days. Placing them in a seniors’ home is considered to be shameful. There is an Arab proverb that says, “If you do not have an elder in your household, bring an aging tree trunk into your home.” This symbolizes that wisdom comes only with age. Arabs are also very involved in their communities. They are generous and are expected to extend kindness and charity toward everyone. Arabs are very social. They like to visit each other’s homes and make new friends and connections. The welcoming phrase “our house is your house” is often used. Visits are a pleasant time to enjoy each other’s company and to display hospitality and generosity. When they meet you, they often invite you to join them for a cup of tea or coffee, served with a cookie (kaaek) or some dates. The offering of food is both a gesture of friendship and a source of pride. A refusal of their offer is considered to be disrespectful, so arrive with a healthy appetite! Women and men often greet one another by exchanging kisses on both cheeks. In some countries, greetings involve touching nose to nose or exchanging kisses on the forehead. When greeting an elder, it is respectful to kiss their hand and bring it to your forehead. In some countries, it may be inappropriate for a woman to be the first to extend her hand. If a male offers his hand, it is then proper to accept. Most religious people will not extend their hand with the opposite gender. So if someone extends their hand and the religious person doesn’t respond it is not an insult; they just don’t want physical contact. The religious person would normally place their hand over their heart and smile instead. In the Arab culture, dating or intimate relationships before marriage are not tolerated. Sisterly or brotherly kisses among relatives are allowed. Passionate kisses among unmarried couples are not allowed. Sanctions or punishments for disobeying vary among families and groups. For Muslims, an established principle in Shari’ah law (Islamic holy law) is the preference for the right hand over the left hand. Because the right hand is considered to be nobler, it is the hand to be used when entering a mosque, saying salaam at the end of the prayer, eating and drinking, and shaking hands. For other less noble activities (entering a washroom, cleaning oneself after using the toilet), it is preferable to use the left hand. Like the term American, Arab is a cultural and a linguistic term, not a racial term. It refers to people who speak Arabic as their first language. Arabs share a common culture, but they do not all share the same religion. Arabs make up less than 18 per cent of the world’s Muslim population. Islam is a religion, and its followers are called Muslims. Nearly one-quarter of the world’s population (approximately 1.2 billion people) practise the Islamic faith, making it the second largest religion in the world after Christianity. Although the vast majority of Arabs in the world are Muslim, this is not the case among Canadian Arabs. According to the 2011 Statistics Canada census data, 55 per cent of Canadian Arabs reported belonging to a Muslim faith and 34 per cent reported belonging to a Christian faith. The remainder belonged to other faiths or had no religious affiliation. The Arab world is built upon a highly developed ancient civilization where modern cities continue to mingle with old-world culture and traditions. Historically, Arabs have made a number of contributions to Western civilization both through their own ideas and by adapting and improving upon ideas from other civilizations (such as the Chinese, Greeks, Romans and East Indians). Unfortunately, Arabs are often not given the credit they deserve for these contributions. Some major contributions are summarized below. The word admiral comes from the Arabic amir a ali (meaning “high leader”). Magazine is from the Arabic word makhzan (meaning “a storage place”). Other words originating from Arabic include almanac, apricot, average, carat, cork, cotton, crimson, gauze, giraffe, guitar, henna, lilac, sherbet, talc, tambourine, typhoon, zenith and zero. Arabs have thousands of proverbs. They created their proverbs to provide advice on things that took place in everyday life. Ancient Arabs had a highly developed medical system. Much of it was based upon previous work done by the Greeks and medical practitioners from India. They also had a very strong hospital system with well-trained doctors and nurses. Smallpox was diagnosed and treated by Arab doctors many years ago. The main Arab medical textbook, the Canon of Medicine by Avicenna (Ibn Sina), was used until 150 years ago. Arabs introduced the world to algebra, trigonometry and Arabic numerals. Arabs invented the astrolabe, the quadrant and other navigational devices that were important in the European age of exploration. Arabs named numerous stars and had highly developed navigational skills. Ibn al-Haytham, an Arab scholar, developed an original theory of light and optics. His theory led to the development of the telescope. He is also credited as one of the first to use the scientific method. The oldest universities in the world are in Arab countries. Arab scholars studied and preserved knowledge from the ancient civilizations of Greece, Rome, China and India and translated the works of Aristotle, Ptolemy, Euclid and others into Arabic. There are many Arabs who have become famous through their contributions to sport, entertainment, business and politics. An Arabic proverb states that “there is no difference between black and white except by good deeds.” Both Christianity and Islam caution that people should not be judged by their skin colour. Arabs have been portrayed stereotypically in television and films for many years. In old movies, they were often depicted as villains, oil-rich sheiks or belly dancers. The new stereotypical image is that of a terrorist with a desire to take over the world. Contrary to sensational stories in the news, terrorism is not encouraged or considered acceptable among either Arabs or Muslims. Islam rejects all forms of terrorism, extremism, fanaticism and fundamentalism. The sanctity of all life is considered to be sacred. The life of a non-Muslim is considered to be as sacred as that of a Muslim. The majority of Muslims are moderate, pious people who suffer from terrorism and violence just as non-Muslims do. Extremist views are held by only a very small number of individuals who operate outside of societal norms. In the aftermath of the 9/11 tragedy, Arabs around the world were cast in a light of suspicion and negativity. Although emotional responses have lessened with time, a wave of prejudice against Arabs is still being felt in the West. Prior to this tragic event, acts of terrorism were generally considered to be isolated in both time and space. In reality, terrorist acts have been committed by individuals and groups throughout history. The first recorded use of the term dates back to 1795, when the French word terrorisme was introduced to describe the actions of citizens in revolt against the post-Revolutionary government of the day. Since that time, many ethnic and religious groups (as well as fanatical individuals) have committed acts of violence in the name of revenge, religion or hatred. One of Islam’s strongest teachings is a directive to care for widows, orphans and the poor. Islam teaches that women are to be considered as equal and capable partners of men. Without women, there would be no families. Although in some societies women may be treated according to ancestral customs or tribal beliefs, the Qur’an instructs that they be treated with respect and honour. Violence against women or forcing obedience against their will is not sanctioned. Today, the majority of Arab countries strongly support and encourage the education of females. Throughout history, Muslim women have served as presidents and prime ministers. See the Arabian Business website for further information on the contributions of Arab women. The situation for Muslim women varies greatly from country to country. Because people in the Arab world are generally conservative (by North American standards), modesty is considered to be a positive trait. However, dress codes and customs vary greatly from country to country. Strongly traditional countries (such as Saudi Arabia) continue to require women to cover their faces, hair and body. A few countries continue to require women to wear a burka. Although Arab women were traditionally required to cover themselves completely, many Middle Eastern countries (Lebanon, Syria and Egypt) have lifted these restrictions. In the Western world, fewer women today adhere to traditional dress, opting instead to cover their hair with a head scarf called the hijab. As with youth around the world, dress codes and customs are increasingly being questioned among younger women. See Clothing for more detail on female dress. Arab Christians do not practise polygamy. Although a Muslim man may take more than one wife, the first wife has the right to divorce him if he does so. If a polygamous immigrant wants to sponsor a wife other than this first, he must legally divorce his other wives and remarry in a form of marriage that is valid in Canada. This section is intended to provide you with practical assistance when a new Arabic student (often with limited English language skills) arrives at your door. The intent is not that you follow each suggestion, but that you select those that are practical for you. The quotes which appear throughout this section reflect the voices of teachers who have had many years of experience working with Arab immigrant students and families. Each student comes to you with a unique personal history. The more information you have, the easier it will be for you to develop a program to meet the academic and social needs of your students. Learning about your students’ language, culture, values, family and home environment will help you to support both the students and their families. Since there may be delays in sending information between countries or school districts, you may wish to consider gathering information about new students by using a translated written form (see sample below). The form could be sent home, or you might set up an appointment with the parents (either at school or at their home) to go through the information together. Consider using an interpreter from the community if one is available. Try to find out about your new students’ circumstances prior to their arrival at your school. If they have come from a refugee camp or a war zone, they may need extra time and support to transition to a new learning environment. Look for “the story behind the story.” If a student is acting out or stealing from her peers, she may be suffering from trauma and require counselling. It is important to keep in mind that customs, foods, values, dialects and traditions may vary from one Arab country to another. Please see the Sample Student Information Form in the downloadable resource booklet. In Arab culture, teachers rank next to clergy in status. According to an Arab saying, “the parents own the bones of a child, but the teacher owns the flesh.” This means that although parents bring the child into the world, it is the teacher who shapes the child’s thinking and behaviour. Because teachers are held in such high regard, they are expected to model moral and exemplary lifestyles both publicly and privately. They are expected to instruct and support spirituality and morality, as well as teach academic subjects. It is not unusual for parents to contact teachers for guidance in their child’s overall development, not just their academic education. Although this may appear to be an onerous responsibility, it also means that teachers can count on the support of Arab parents and their community in working collaboratively to achieve success for their children. Be proactive in involving parents. Most parents will respond positively if they understand what actions they might take to support their children’s education and social/emotional development. Make an effort to support Arab businesses in the community (stores, bakeries, restaurants) and identify yourself as a teacher. Attend Arab community events such as Eid banquets and awards events. Invite parents to school events. Try to identify resource people within the local Arab community and ask for their assistance with advice and information for both parents and students. Most Arab students continue to speak their first language in their homes. The more Arabic that you know as a teacher, the more you will be able to reach out to your students and their families. Knowing just simple and basic vocabulary or greetings can make your student feel more comfortable. This demonstrates that you respect and value their language. Wherever possible, make an effort to provide parents with translated documents or the services of an interpreter. A Student Code of Conduct or legal document may be difficult for even English-speaking parents to understand. Translating permission slips or invitations to school events into Arabic will increase the possibility of their involvement. Making the school website available in Arabic will help parents make appropriate choices for their child. To check the pronunciation of a word, use an online dictionary such as The Cambridge English-Arabic Dictionary. Please see the table of Common Arabic Words and Phrases in the downloadable resource booklet. In general, Arabs are loving, humble people and they expect others to respond in kind. The circumstances of the family’s arrival to your community may be a factor in their receptivity or preparedness to engage with you. Be aware of gender dynamics. If you are a female teacher meeting with a male parent for the first time, you may wish to consider inviting a male colleague to join you for the interview. Try to call home with congratulations from time to time to dispel the idea that the school calls only when there is bad news. Because family life and harmony are crucial to Arabs, educators need to demonstrate respect for the nuclear and extended family. Since Arabs are very sensitive to public criticism, teachers should try to express concern about the student in a way that minimizes “loss of face” for either the student or the family. The goal is to help students develop a positive identity while respecting their heritage. Review school dress codes or change-room requirements to ensure that they do not violate Muslim traditions of modesty or fasting. Ensure that girls are not ridiculed for their head coverings or dress. Avoid scheduling tests on major Islamic holidays and respect fasting requirements. During Ramadan, teachers should be sensitive to the physical stress that may result from fasting. Try to schedule prayer opportunities into regular break periods. If students tell you that they need to leave school to participate in Friday prayers, ask that they provide you with parental consent. This will ensure that religious requirements are not used as an excuse for missing class or assignments. During the month of Ramadan, some parents may use the time to return to the Middle East for family vacations. If so, parents should assume responsibility for missed work. Because the serving of food in school may be an issue for students who can only eat halal food, it is helpful to identify students with this requirement and to develop a schoolwide policy regarding food. See background information on Holidays and Religious Observances. Reduce social isolation for your new students by using cooperative learning strategies and allowing students to work in pairs or groups. Present new information in multiple forms (oral, written and visual). Because Arabic is an aural culture, try to read directions aloud. When students (at any age level) have very limited reading skills, they respond to pictures. Using picture books supports language acquisition by increasing both vocabulary and comprehension. When students are engaged and able to understand and follow the story, they are motivated to share their feelings and reactions. See Resources for Teachers for a list of picture books for Muslim kids. If your new students are comfortable doing so, invite them to share information about their country, their culture (food, music) or customs. If possible, arrange a field trip to a mosque or local bakery, or invite an Arab member of the community to speak to the class. See Community Resources for suggestions. Social Studies—Conduct research on Arab contributions. Music—Introduce students to Middle Eastern music and instruments. Art—Examine and experience the symbolic representation of Arabic script. Language Arts—Look at and listen to Arabic stories and poetry. Math—Collect statistical data on Arab countries and create charts. During the holiday season in December, organize a week-long Celebration of Celebrations activity in which all the students and the families can share their heritage, culture, customs and traditions. This can lead to an understanding of everyone’s culture and community in an authentic manner. In the younger grades, students are exposed to and develop an appreciation for the foods, clothing and special traditions amongst families. In the older grades, the students can write a report on the similarities and differences and do research on the cultures and countries that interest them. This is a very inclusive activity that allows even the most shy and reluctant student to participate. Even though they are in a new country, students and their families continue to be impacted by events in their homeland, which may be affecting friends, relatives and former neighbours. See the Brown University website for an excellent lesson that simulates a refugee experience. Any use of derogatory language or name calling must be addressed immediately. Capitalize on teachable moments to deal with common myths and misconceptions. In response to negative news reporting (which sells papers! ), teachers can use these opportunities to engage students in informed debate about related current events. This might be reflected in the pronunciation, grammar and comprehension. For example, the use of the /b/ for the /p/ sound in the beginning of words such as paper and pencil. See the Frankfurt International School website for highlights on the phonemic and grammatical challenges that Arabic speaking students might face while learning English. Ensure that a safe and caring school environment is provided for all students. Develop and enforce a school policy that clearly communicates to all parents and students that disrespect or discrimination will not be tolerated within the school. Identify community and district-level resource people and encourage teachers to invite them into the school. Provide oral and written translation services in Arabic for documents such as a Student Code of Conduct, permission slips and invitations to school events. Assist teachers in gathering background information on new students. Support staff development and training in the area of diversity. Initiate and support multicultural events. Respect religious observances and holidays. Provide time and a private space for prayers upon request. Develop a school policy that addresses halal food requirements, and communicate the policy to all staff, students and parents. See pages 25 – 31 of the downloadable resource booklet for an English-Arabic guide that can be printed and shared with parents and students. It is just one tool to assist schools and Arab families in better understanding and communicating with each other. Note: All of the websites cited and linked below were active and current as of the time of publication. Pearson ELT – A range of English language teaching materials for K–12 as well as general and business English. 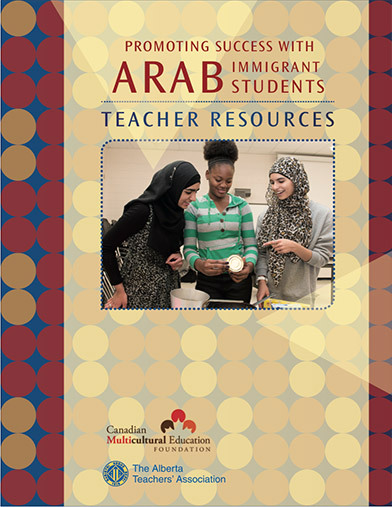 Teaching Refugees – This resource is for educators of English language learners who face additional challenges as a result of the circumstances of their migration and their lack of opportunity for prior schooling. It provides access to information, publications, educational materials and exemplars from the field that promote effective programming for students with this profile. Woodlands Resources Woodlands School has a nice list of punctuation activities. The sites below can be used independently or with the entire class. Kids’ Vocab by MindSnacks introduces students to tier 3, low-frequency, context-specific vocabulary words. Each set of words is organized around a theme and built on games that keep children excited about learning. EF High Flyers is an easy-to-use game that helps students learn new vocabulary words starting with numbers and everyday objects. After studying a set of words (with audio and picture support), they test their knowledge through spelling, vocabulary listening and reading quizzes. Flashcardlet – If you’re looking for a way to load your students’ iPads with custom vocabulary, check out this app by Quizlet. It allows students to access decks of flashcards you’ve made right from their iPads. Quizlet is a free website that allows you to create flashcard decks based on your own list of words. Futaba is a great word game for one to four players. Futaba presents players with pictures of everyday items and asks them to name each object. Simple and fun, this is a game that encourages player competition to see who can choose the correct name for an item from a list of four choices. Whoever gets the most correct answers in one minute wins the round. ATESL Resource Database – The Alberta Teachers of English as a Second Language (ATESL) is a professional organization that promotes the highest standards of teaching and English language program provision for all learners in Alberta whose first language is other than English. Learning English with CBC – Break the Wall. Use these supportive lessons to help you and your family adjust to life in Alberta and practice English at the same time. These lessons were developed around Government of Alberta resources. Database of Award-Winning Children’s Literature – A database that allows you to search for both picture and chapter books by variables such as genre, historical period or grade level. Children’s Library – Free access to high-quality digital books from around the world. – The Ready to Read Books from Simon & Schuster are children’s books at four different reading levels: recognizing words, starting to read, reading independently and reading proficiently. Also look for the I Can Read book series by Harper & Row. Let’s Explore Arabic Alphabet – A free interactive alphabet eBook that teaches the Arabic alphabet in an engaging way through videos, audio, and interactive games and puzzles. In addition, the textbook features sections on Arabic culture, history and the history of the Arabic script. Aramco World is a rich website of information and resources about Arab and Islamic culture. Most of the material is at the high school level, but there is a large section called “Young Reader’s World” designed for 8 to 15-year-old students. Articles in both this section and the main section have accompanying classroom activities. You can also subscribe to the free AramcoWorld magazine, published six times a year. Back issues and classroom sets are also available. The site and the magazine are owned by the Saudi Arabian Oil Company. An Edmonton directory of the Arab community in Alberta that includes a wealth of information about the Arab world, Arab culture, Arab food, etc. Literature is an effective entry into a culture. At thei website you will find 105 modern Arabic books selected by the Arab Writers Union. Canadian Arab Friendship Association – The website has a wealth of information about Arab culture, Arab history and the Arab community in Alberta, everything from a guide to 25 local and national Arab community organizations to a list of Arab accomplishments in history. Richard Awid – Richard is a retired teacher and a leader in the Arab-Canadian community. He will assist you in finding resource persons for the classroom and in planning field trips to Arab institutions in greater Edmonton. Salatomatic – List of mosques in Canada, listed by province and city. This is one of the oldest Islamic congregations in North America. The original building is now in Fort Edmonton Park. Contact Ms Salwa Kadri at 780-451-6694 for a tour of the new building. Contact Fort Edmonton Park or Richard Awid, 780-807-1116, for a tour of the original building. The list below is only a sampling, and should not be considered as a list of recommendations. There are too many Arab groceries and bakeries throughout Alberta to list them all.